Number one pound-for-pound boxer Manny Pacquiao is back on Twitter under the user name @MannyPacquiao. Manny Pacquiao is once again a member of twitterverse after his previous account @CongMP was deleted on March 22, 2011. Pacquiao, a very popular boxer and a current member of the Philippine Congress, deleted his previous Twitter account after he was criticized by his Filipino followers for his absence in the ongoing impeachment proceedings of the Ombudsman Merceditas Gutierrez. Manny Pacquiao was said to have acted harshly to criticism for his absence from congress during an important proceeding. Manny Pacquiao was in Baguio City training for his upcoming bout against Shane Mosley when he aired his opposition to the impeachment of the Ombudsman via his Twitter account. Criticisms against Pacquiao’s online behaviour came after he tweeted “@momblogger e di mag reklamo ka doon sa lolo mo hahahaha thanks” (Raise your concern with your grandfather). Pacquiao’s tweet came after he was asked by Twitter user @momblogger why he was not in congress to take part in the impeachment proceedings. A screen shot of the exchange of tweets between Pacquiao and his followers was captured and posted on gmanews.tv. 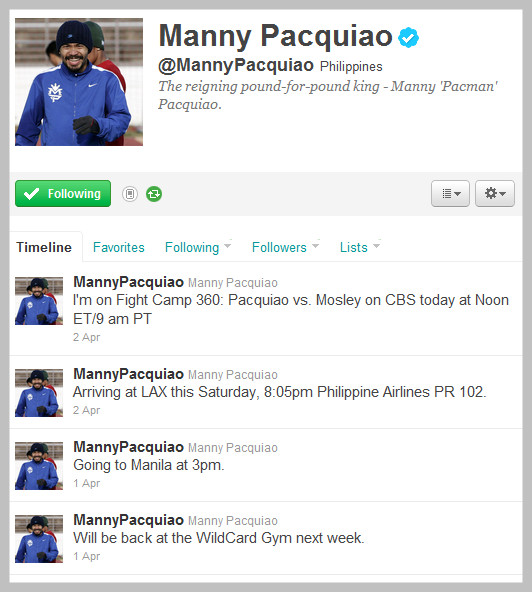 Pacquiao apparently cannot live without Twitter, so he is now back under the @MannyPacquiao user name. Maybe he realized he needs a Twitter account now more than ever as his fight with Shane Mosley draws near. Pacquiao’s earliest tweet in his new account is dated April 1, 2011, one that informs his followers that he will be at Freddie Roach’s Wild Card Gym next week. Below is a screenshot of his latest tweets.